There are many options available to you. All of these regularly scheduled activities are open to all. Come and join us! Participating in smaller groups helps you deepen your connections and get to know your fellow Northlakers better. Second Saturday Socials – We have a social event on the second Saturday of every month, typically in the evening. 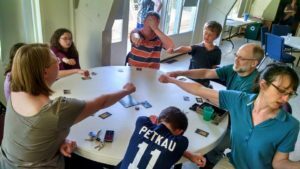 These include Board Game Nights* at church, outings to local Restaurants, Cottage Suppers at member’s homes, and summer picnics*. Watch the weekly announcements emails or look in your Sunday Order of Service for the details on this month’s plans and how to RSVP. 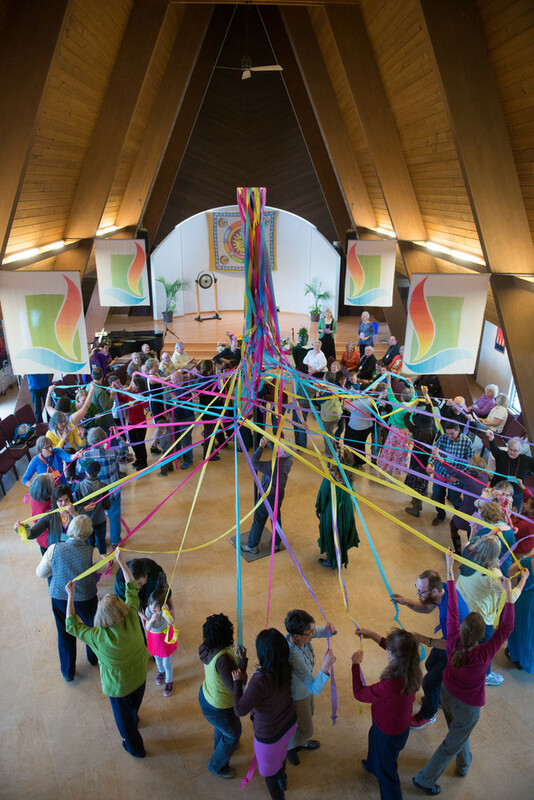 Third Sunday Potlucks* – We have a potluck lunch on the third Sunday of the month, in the sanctuary after church. We ask that everyone bring an item to share. (Although if you are simply not able to do so, you’re still welcome to attend!) On these days, please help with setting up tables after the service, or cleaning up after the potluck. 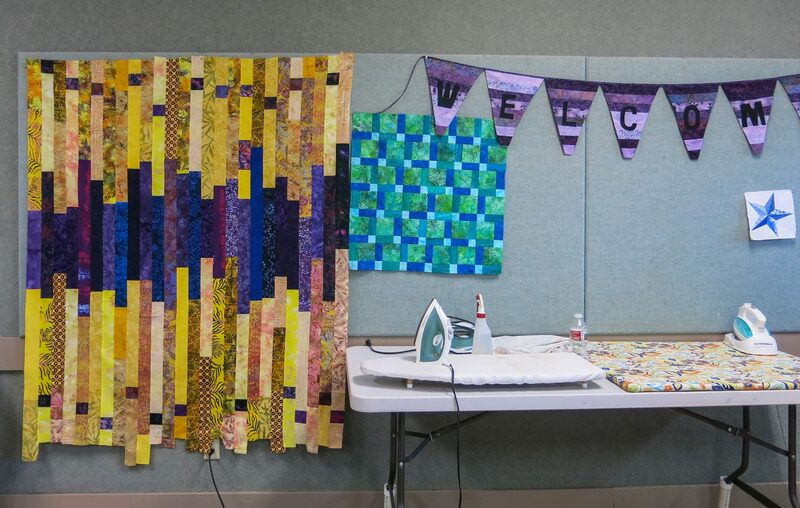 Seamsters – Do you like to quilt, sew, or do other creative activities? 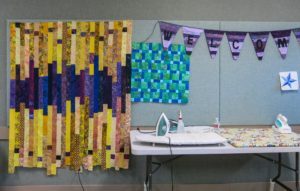 Seamsters meet the second Monday of every month, at 7 pm in Adams Hall. Choir – Do you like to sing? 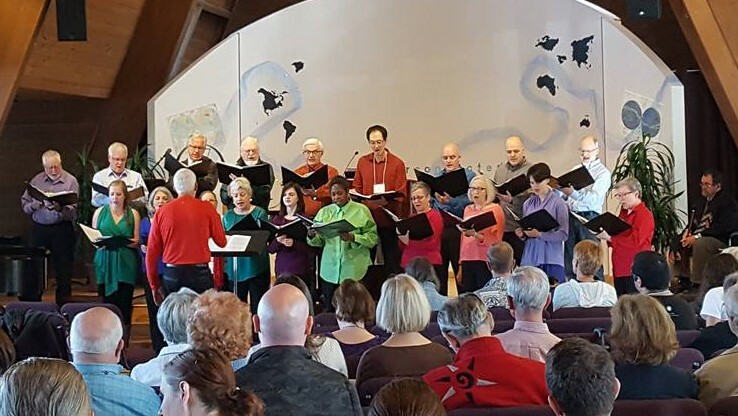 Choir practice is from 1 – 3 pm in the sanctuary, on three Sundays each month. No experience required. Men’s Group – Breakfast, check-in, and a discussion topic. 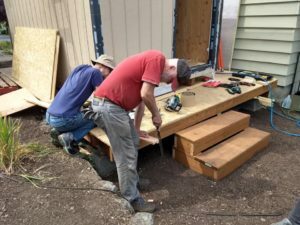 First and third Saturdays, 9 – 11 am. Location alternates between chapel side room and a member’s home. Women ’s Group – Social time, check-ins, program or activity. Typically fourth Mondays, social time at 6:30, meeting at 7, in Adams Hall. Camping* – Hosts an annual campout, typically Labor Day weekend. Location varies. Earth-Based Spirituality Group – Sponsors celebrations of seasonal holidays such as Beltane, Samhain, Equinox and Solstice. Meaningful Movies – A free screening of a documentary film about social justice or environmental issues, followed by a discussion. 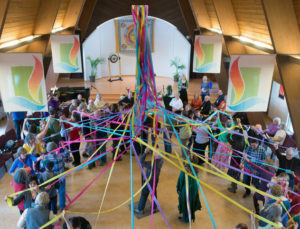 Third Fridays at 7 pm in the Sanctuary. Eastside Insight Meditation – Gather to meditate together and discuss Buddhist teachings. First and Third Thursdays, 7 pm, chapel. No experience needed. Chronic Pain Support Group – Many Tuesdays 11 – 12:30 pm in Northlake chapel. Please email DLRE Margaret Rogers to confirm time and place. Adult Religious Education – Soul Matters Discussion Groups, (Re)New UU classes, and other learning opportunities. 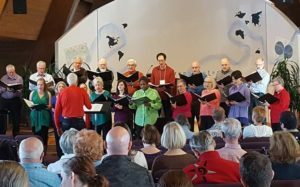 Music – We have choir twice a month. At other services, we welcome special music. If you sing, or play an instrument, we’d love to hear you! Contact our music director. Worship Team – You can help by setting up the room, putting away worship supplies after the service, creating PowerPoints on Friday or Saturday, running slides or audio in the service, or serving as celebrant or song leader. Or plan and implement sanctuary decorations to match monthly themes. Building & Grounds – Assist with building maintenance and improvement, deep cleaning projects, gardening and other grounds work. Finance, Endowment, Fundraising, or Human Resources – Do you have knowledge or experience in finance or HR (or even just a good head for numbers and policies)? We need you! Stewardship Team – Spearheads the annual stewardship drive. Encourage conversations about what Northlake means to members, and inspire them to give. Caring Committee – Supports the minister with pastoral care, identifying needs, connecting needs with resources, and sending cards. Membership Team – Help Northlake truly be a “vibrant and welcoming community”. Help newcomers connect and find their place at Northlake. Fundraising – There are a lot of ways you can support Northlake financially. One of the easiest is to participate in rewards programs – when you spend money you would be spending anyway (at Amazon, Fred Meyers, Bartells, dining out and at many stores), Northlake gets a portion of what you spent! Learn about partner fundraising programs. Immigration detention center. 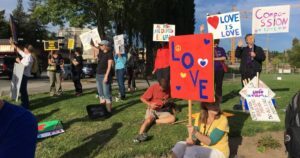 On the last Saturday of each month, join a carpool to Tacoma to support family members who are visiting loved ones who are being detained. Community suppers Several times a year, we provide food, serve a meal, and join attendees for dinner. Tuesdays 5 – 7 pm at Holy Spirit Lutheran. 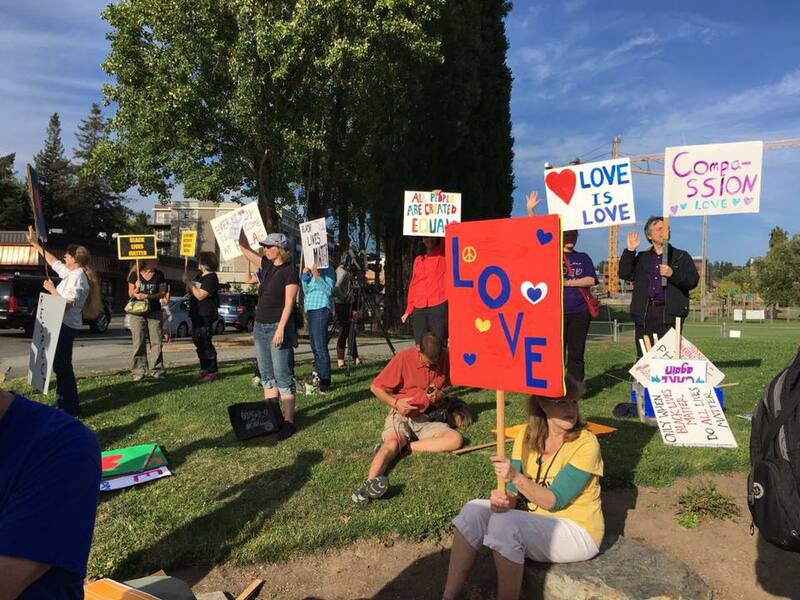 Vigils, parades, marches* – As events in the community and the world demand, we gather to show our support for peace and love and to speak out against injustice. Join us! * For kids and parents: Northlake is committed to facilitating family involvement in activities whenever possible. For adult groups, childcare is available if requested in advance, and children and youth are encouraged to participate in all activities marked with a “*”. Parents are always welcome to sit in on the children’s RE program. This page describes the standard schedule for recurring events, but be sure to double-check the Northlake calendar for the most up-to-date schedule and locations of upcoming events, or subscribe to our weekly announcements. Be sure to also learn about annual traditions, including Animal Blessing service, SummerFest and other summer FUUN events, and more. As you become more involved at Northlake, you are encouraged to become a member. Learn more about the Pathway to Membership.